Freshman Harvard quarterback Jake Smith showed some moves as he slalomed through Princeton defenders on a 26-yard run. 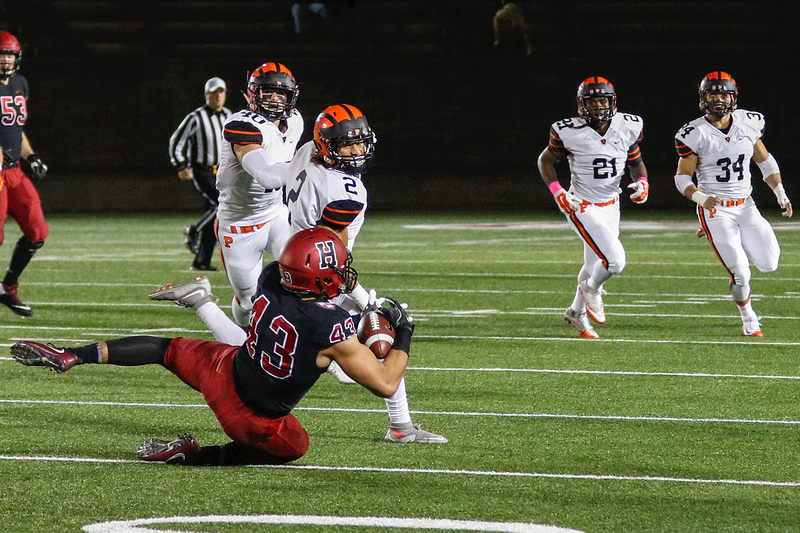 No holding that Tiger: Princeton’s Jesper Horsted, with 13 receptions, proved a tough matchup for Harvard defenders such as freshman Isaiah Wingfield. Senior defensive lineman Tristan Tahmaseb (91) and his mates largely were kept away from Princeton pass master Chad Kanoff (11). Senior tight end Ryan Antonellis (43) took a slide to corral one of his six catches, tying him for team-high. 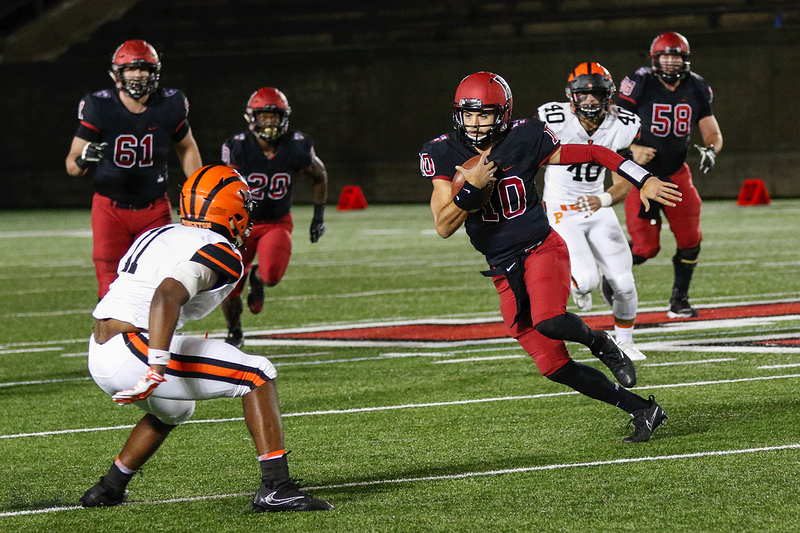 The Princeton Tigers, riding the scorching hand of quarterback Chad Kanoff, entered Harvard Stadium on Friday night and administered to the Crimson a 52-17 stomping. (Or whupping…or smackdown…or thumping…or thrashing…or shellacking…insert favorite noun here.) The loss drops Harvard to 3-3 overall and 1-2 in Ivy League play, thus almost certainly dooming any title hopes. Moreover, the Crimson must win its final four games to maintain its streak of winning seven or more games, now standing at 16 seasons. Princeton rose to 5-1 overall and 2-1 in league action. The result brought forth superlatives, most of them negative from the Crimson point of view. The 52 points allowed were the most by an opponent in the 24 seasons that Tim Murphy has been coaching the Crimson. The margin of defeat was the largest since a 52-13 demolition at Penn in 1988, and the largest loss in the Murphy era since 2002, when the Crimson was drubbed 44-9 at Penn. This was Harvard’s first loss in a Stadium night game after 14 wins. Old-timers might recall a couple of similar poundings by Princeton at the Stadium in the ’60s. Back then, the likes of Ellis Moore and Scott MacBean plastered the Crimson, 45-6 in 1967 and 51-20 in ’69. Four years ago, Quinn Epperly passed the Crimson silly in a 51-45, three-overtime Tigers win. Friday night woke the echoes of those performances. Now add Kanoff to the roll of visiting villains. In building a 31-10 halftime lead, the Tigers senior completed his first 20 passing attempts. (He added another completion in the second half before his string was snapped; at game’s end he was 31-for 35, for 421 yards and two touchdowns.) The onslaught began on Princeton’s first offensive series, when Kanoff directed a 10-play, 89-yard drive capped by a 20-yard scoring pass to a criminally open Jesper Horsted, at 6-foot-4 one of the Tigers’ two Brobdignagian main receivers. (Stephen Carlson, the same height, is the other.) On the next series, the Crimson held Kanoff and the Tigers to a Tavish Rice field goal, partly thanks to a sack by defensive lineman Stone Hart ’18. But after a Harvard three-and-out, the Tigers went 66 yards for another touchdown, the big play being a 27-yard Kanoff- to-Horsted hookup. It was 17-0 and there were still more than nine minutes to go in the first half. To his credit, Harvard quarterback Jake Smith ’21 hung in there. Princeton was mostly jamming up the running of Charlie Booker ’19 (held to 72 yards on 19 carries), so Smith took to the air, hitting tight end Ryan Antonellis ’18 for gains of 13 and 11 yards. Then Smith used his legs, making a nifty dash for 26 yards. When the drive bogged down, Jake McIntyre ’20 booted a 28-yard field goal. Princeton 17, Harvard 3, with 4:11 left in the half. But as soon as Harvard began to get its head above water, Princeton pushed it back down. From the Tigers’ 34, Kanoff and Horsted worked the old buttonhook play. Horsted took a quick slant, reversed his field, and ran all the way to the end zone. With the point after by Rice, it was Princeton 24, Harvard 3. There was no quit in Smith. He quickly brought the Crimson back, engineering a five-play, 80-yard drive. 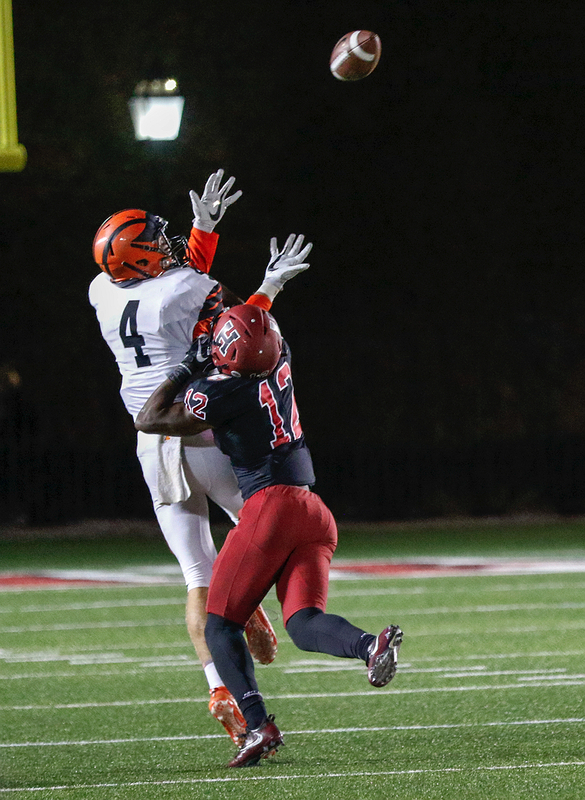 The biggest play was a 44-yard strike to tight end Dan Werner ’19, who made the snag at the Princeton two even as a Tigers defender hung all over him. On the next play Booker barreled into the end zone. With McIntyre’s extra point, it was Princeton 24, Harvard 10. But Smith had made one mistake—leaving Kanoff too much time. Eighty-eight seconds remained in the half, and the Tigers only needed 57 of them and five plays to get back into the Crimson end zone. Three plays were completions to Horsted (who caught nine passes in the half), and the capper was a 14-yard scoring run by Charlie Volker. Rice kicked the point. Princeton 31, Harvard 10. To start the second half, the Crimson defense at last forced a Princeton punt (by do-everything Kanoff). But on Harvard’s second offensive play, Booker was hit by Tigers defensive back Chance Melancon and fumbled. Princeton recovered and rammed the ball 27 yards for a score, the touchdown coming on a fourth-and-one after a nearly successful goal-line stand. 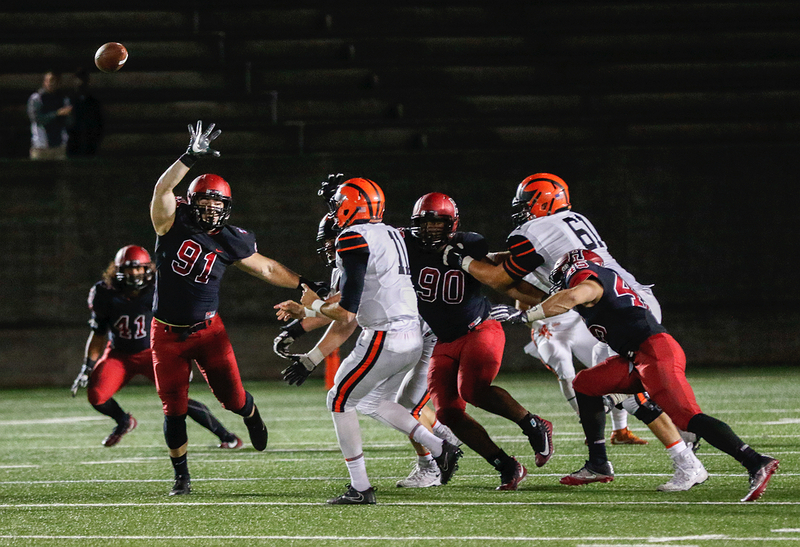 Richie Ryan ’19 blocked Rice’s point-after attempt, so it was Princeton 37, Harvard 10. Princeton’s next score came on a sweet end-around play, with Horsted taking the ball from Kanoff and passing two yards to Carlson. Though ahead by 33 points, the Tigers elected to try a two-point conversion—which succeeded when Kanoff fired to Tiger Bech in the end zone. Princeton 45, Harvard 10. Thereafter Princeton backed off—some. The Tigers mostly stayed on the ground, but Collin Eaddy still was able to blast off tackle for a 32-yard score. Princeton 52, Harvard 10, and the Tigers’ high-octane attack had broken the 50-point mark for a third straight week. Murphy kept Smith in the game, perhaps feeling that adversity would only make him stronger. The youngster kept on flinging—he finished a creditable-looking 20 for 31 passing, for 268 yards—and led an 86-yard drive, culminating in a one-yard run by Aaron Shampklin ’21 that made it 52-17. That touchdown provided little solace to a Crimson fan base that is accustomed to seeing football in November with a title on the line. In a way, they still will. Of Harvard’s final four games, three are against current contenders: amazing Columbia (unbeaten), and Dartmouth and Yale (one loss each). The Crimson is relegated to the role of spoiler. Let’s see how that plays out. Coming up: Concluding its home stand, Harvard meets longtime rival Dartmouth (and coach Tim Murphy takes on his opposite number and boyhood chum Buddy Teevens) at the Stadium. Kickoff: noon. The game will be telecast on NESN and the Ivy League Network, and broadcast on the radio on WRCA 1330 AM, 106.1 FM and 94.5 FM-HD2, WHRB FM 95.3. The Big Green stands at 5-1 overall and 2-1 in the Ivy League. Harvard leads in the all-time series 70-45-5 and is riding a 13-game winning streak, including last year’s 23-21 squeaker at Hanover.